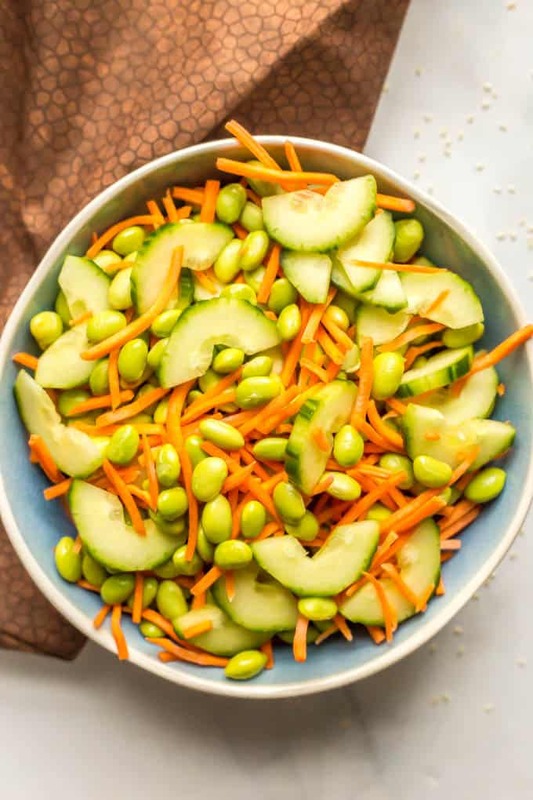 Edamame, carrot and cucumber salad with soy ginger dressing is a light and refreshing salad with a little kick and a lot of flavor. 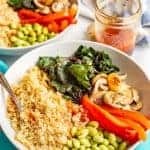 It’s perfect for an easy dinner side dish and is vegan and gluten-free. Welcome to a new week my friends! Felt good and now we’ll have a pretty spot to look at all spring and summer! But of course we’re all here for the FOOD! Today’s recipe is a “me” kind of recipe. I’m not the only one who does that right? Right?! My husband would probably go for it as a side dish — he’s happy to go along with pretty much whatever I serve. 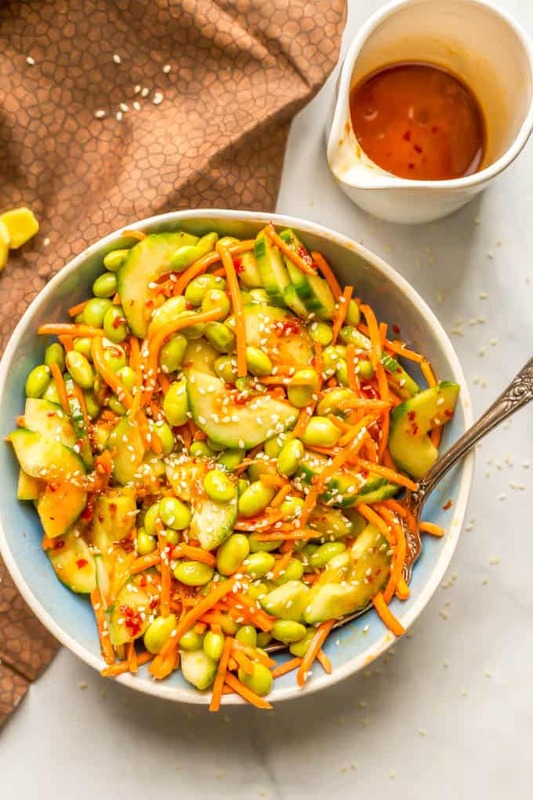 But really, I’m the one who loves and adores each and every flavor and ingredient in this edamame, carrot and cucumber salad with soy ginger dressing. So I make it for me and inhale it all myself! 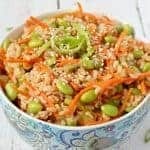 The edamame for this recipe needs to be cooked and cooled, so please plan accordingly. You can sub about 1/2 teaspoon hot sauce and 1/2 teaspoon minced garlic for the chili garlic sauce if you prefer. You can adjust the amount of hot sauce to your spice level liking. 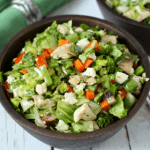 You can also add chopped green onions or thinly sliced red onion to this salad if you prefer. The dressing for this salad is a half portion of my homemade soy ginger dressing. I included the ingredients and amounts in the recipe card below as well. 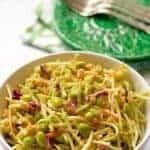 This salad keeps for 2-3 days in a covered container in the refrigerator, but it will start to lose some crunch after the second day. 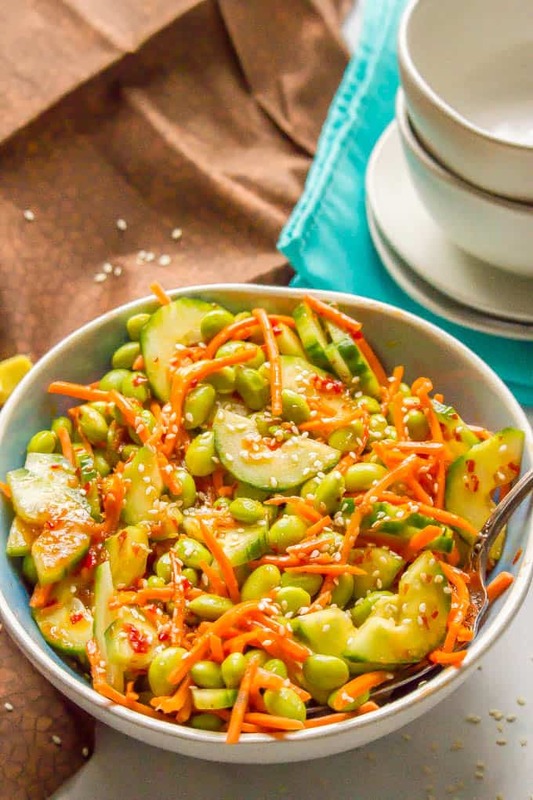 Whether or not you plan to share this, I hope you give this easy edamame salad a try! 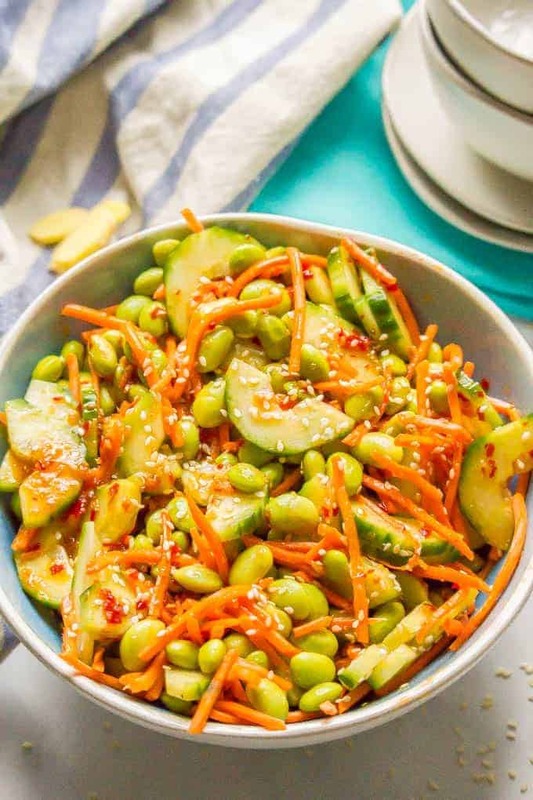 This easy edamame salad with soy ginger dressing is light, refreshing with a little kick and a lot of flavor! 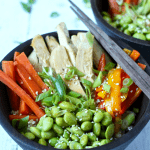 Combine the cooked and cooled edamame in a large bowl with the carrots and cucumber. 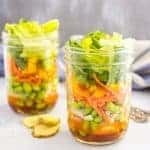 In a small jar or container with a tight fitting lid, add all of the dressing ingredients. Cover and shake well until combined. 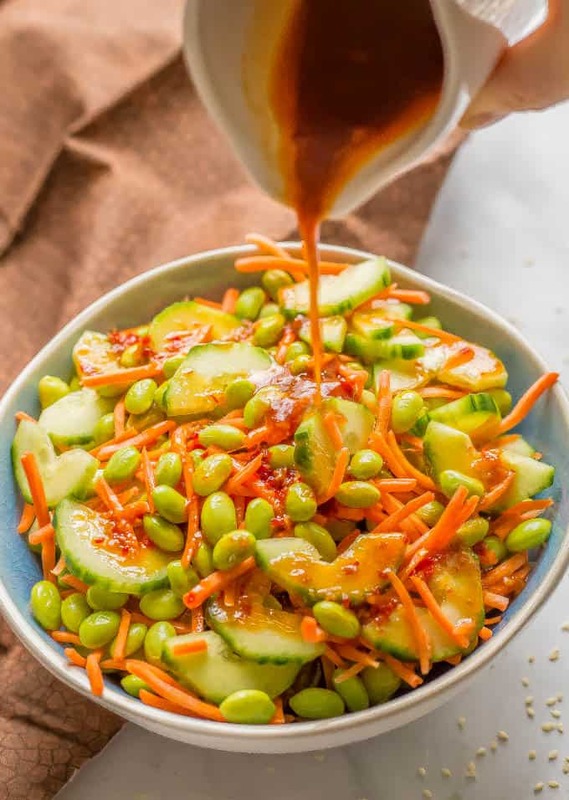 Pour the dressing over the edamame and veggies and stir until everything is well coated. Sprinkle with sesame seeds, if desired, and serve.